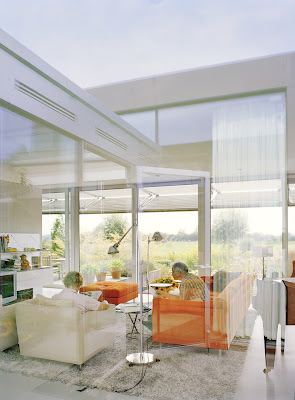 After seeing an article in the German magazine Haeuser, I've always wanted to know more about this house in English. 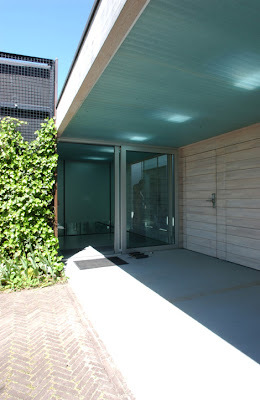 The team at Paul de Ruiter have provided some great insight into this house and its design. I hope you all enjoy. Images courtesy of Alessio Guarino and Rien van Rijthoven as indicated. Paul de Ruiter tells that he had always wanted to build a villa in what he still considers one of the most attractive locations in the Netherlands, on the outskirts of Rhenen, in the Rhine water meadows. So in 1994, as an architect at the start of his career, he made a brave move and took out an option on a plot of land, which was in use at that time for market gardening, and became the developer of this site himself. Henk and Jeanne Deys (65 years old) took the first of the four building plots along with a sketch design for the villa by Paul. 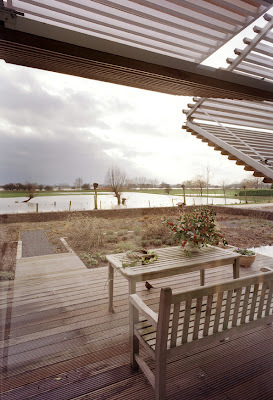 Along with the green roof, top of the list were a pool and accessibility as the couple grew older. Whilst wanting to create something modern, emphasis was placed on blending in with the surroundings as well. If you look down from the hill just behind the house, all you see is the sod roof, the front façades of gabions (retaining walls) and the slat covered façades of the house, which resemble the many farm outbuildings in the area. In producing one of his first houses Paul wanted to establish his style and create a modern, innovative residence. Despite and yet complementing this desire is the attention to meeting his clients needs. Built for an elderly couple, there is nothing in the overall appearance of the villa that indicates this. Looking deeper you notice that there’s no stairs on the property, ramps up the drive, and everything is electronically operated by hardware hidden in the walls. The front door, blinds and curtains are all electronic. There’s also finer detail in the décor. The bathroom and kitchen feature colours so as to distinguish depth, noting that as your eyes deteriorate with age, single colour surfaces are harder to judge. 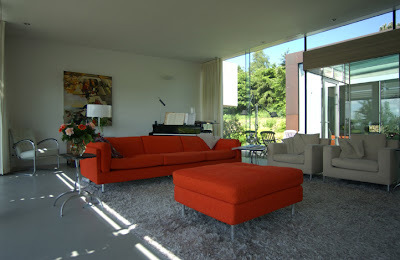 The living areas of Villa Deys are placed around the swimming pool and spaciously blend into each other. The bedrooms and bathrooms are in the back of the house in one strip, and the living areas are at the southern light filled front strip of the house. By adding an atrium and swimming pool between these two elements, then offsetting the roof heights, light enters the back rooms as well. The white floors and walls also help to further disperse the light. The motivation for the indoor pool is threefold, it makes swimming all year round possible, provides safety for visiting (grand) children as it can be locked up, and lets light in between the front and back strips of the house. The glass used around the swimming pool, preventing moisture problems in the rest of the house, is partially sand-blasted. Only a 50 cm high strip at floor height is transparent. As a result, a swimmer in the pool can see into the living room, without being visible himself. The water in the pool is heated (27°C) and also functions as a radiator to maintain the temperature of the house. A key feature of the façade is the panelled shutters. Electronically controlled, these can be opened manually or set on timers. An added bonus is that they close and lock, allowing the sliding glass door behind to be left open in summer without worrying about security. Going one step further, Paul realised the potential for other architects to adopt these shutters and created BOIL. BOIL offers the possibility of sharing products and ideas with other architects and markets the intellectual ownership of the product. The returns of the company are used to finance new developments. For more information, see www.boil.nl. In 2002 Villa Deys won two prizes. 'The Dedalo Minosse International Prize for commissioning a building' and the 'European Architecture Award Luigi Cosenza 2002'. Great blog! It's really nice to see such a thorough report on each project; photos, plans, data and the appropriate credits. Thank you for the meticulous work, we'll be checking in often. I try to inform as much as possible and I'm glad that you like it. I'll do my best to keep it fresh and new. i just want to ask if there is a basement floor for this house? thanks for the blog. nice work. No basement here, they've dug shallow (apart from the pool area) and added under floor heating instead.